The following is a guest post by Pete Mandra, author of Overland. The hectic streets of Delhi, India. Berating lost cab drivers, rushing through exotic landscapes most of us have only dreamed of visiting, and more tears, bickering and overall bad behavior than a liquor-infused holiday get-together. At its worst, I’ve just described an episode of the popular reality television program The Amazing Race, where pairs of travelers compete against other teams in a race around the world to win $1 million US. Personally, I have a ‘love-hate’ relationship with The Amazing Race. When I curl up with my wife, Jessica, on Sunday nights to tune it in, the program serves as the perfect kindling to fuel dreams of our next exotic trip, whether it's Morocco, India or the Seychelles Islands. So what do I hate? ‘Ugly American’ behavior (which, as an American, I am skilled at identifying). Pseudo celebrity contestants, like reality show ‘stars’, athletes, and beauty pageant winners. So, aside from brushing up on my geography, what have I learned from watching The Amazing Race? Plenty, which, when combined with my own travel experiences, may assist you in navigating your next journey through an exotic land. When an Amazing Race team is assigned a task to perform as part of the contest, they must decide what team member is best suited to perform that task, without any assistance by their teammate, and hope for the best. Many otherwise strong teams finish last and are eliminated after they mistakenly select the team member who can’t perform the assigned task in timely fashion, like dance the Samba in Brazil or excel in an Indian tea tasting. Are you one of those people who can be dropped anywhere yet orient themselves instantly? Lucky you – I can get lost in a hall closet. So when my wife and I drove our rental car through the winding, narrow roads of a seaside town in Italy, I resigned myself to map duty while she somehow instinctively guided us to our intended destination successfully. But when we negotiated the price on that exotic, Jordanian vase? I handled that. Know what you excel at and know when you’re overmatched. The Amazing Race is all about flying from Point A to Point B as quickly as possible, meaning saving time by carrying on all luggage is a must (just once, I’d love to see a team mistakenly check luggage and wait, exasperated, for it to finally roll off the carousel). One past season, a team even lost their carry-on luggage and had to make do exclusively with only the clothes on their backs (until afforded the opportunity to buy additional clothes at the next travel stop). With charges levied for checking bags on airlines, it’s in your best interest to pack lightly, or forgo checking bags altogether if possible. Just don’t be one of those people who hog all the overhead space, or frantically push and grab their bag the very second the plane lands (we aren’t going anywhere until they open the doors!). At the other extreme, don’t be compelled to travel without luggage at all, choosing instead to wear layer upon layer upon layer of clothes onto the plane. I’ve seen it. It’s a little weird. Without fail, it seems that during every Amazing Race season finale, when the three remaining teams are on the journey’s last leg for the million dollar prize, victory comes down to being lucky enough to find a cab driver who knows the area. This past season played out like most others – two teams were both fortunate to work with speedy and knowledgeable cab drivers, while the third team lost valuable time after their driver had steered them well off course. Personally, I’ve had the particularly mind-numbing experience of spending three hours(!) in smoggy and suffocating bumper-to-bumper Cairo traffic, trying in vain to translate a hotel map written in English to a cab driver who didn’t read the language. 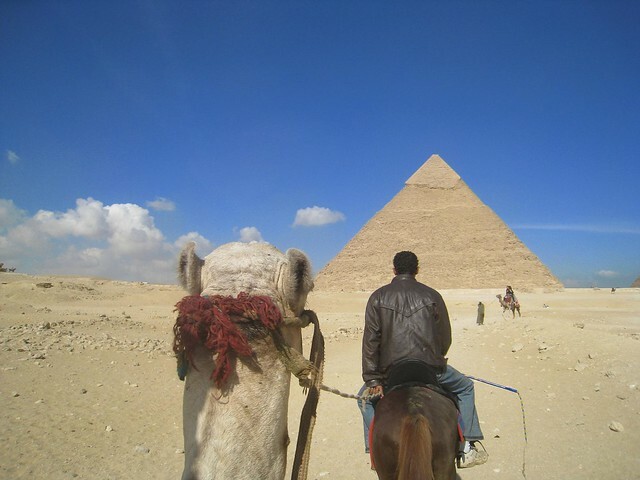 Approaching The Great Pyramids of Giza by camel. Only then did she (thankfully) remind me that ‘bashish’ is a request/expectation of a monetary tip for services rendered, whether it’s uttered by a smiling uniformed police officer snapping your photo in front of the Giza pyramids or by the shopkeeper’s son who tosses your water bottle purchases into a plastic sack. I’m not going to deny that getting hit up for tips at every turn doesn’t get a little frustrating, because it absolutely, truly does. But if you try to accept it as strictly a difference in culture, no different than how we Americans seemingly wrap ourselves in our country’s Flag, it’s a little more tolerable. Ironically enough, due to the frantic pacing of The Amazing Race, contestants seem to only appreciate their international experience when their own journey concludes, usually when they discover they’re in last place and will likely be eliminated from the $1 million competition as a result. It’s at that moment, after reflecting on all of their shared, special moments, does the magnitude of what they’ve been lucky enough to experience – visiting scores of exotic places around the world – sink in. Don’t wait until your journey’s end to appreciate and enjoy your travel experience, whether you find yourself in a city a few hours away from home or in some exotic stretch of South American jungle. Find some quiet time to experience life around you. Pause to the intoxicating aroma of freshly baked croissants from a humble Paris café. Observe children at play in a schoolyard in Africa and delight in their laughter. Embrace the haunting, spiritual sound of the Mecca Call to Prayer, its echoes amplified further as it bounces across a stone clad, Jordanian town square. Remember: travelling somewhere – anywhere – isn’t about marking it off your checklist just to say you’ve been there. No matter where you journey takes you, experience it. Live it. Great Post. You can really learn a lot from that show and get ideas on where you want to travel to next. I love the Amazing Race but, like you, I find it hard when ‘…contestants become rude and obnoxious towards the locals.’ One great example of this was a woman in a taxi in Vietnam who screamed ‘Don’t they speak ANY English around here?’ when the taxi driver couldn’t understand her. Erm, no sweetheart, if he could speak English he wouldn’t be a taxi driver.